Youve been called to China to help in the excavation of the ancient Emperor Qins final resting place. What starts as a simple mission quickly turns into the experience of a lifetime when your colleagues lives are put in danger. Can you uncover the secrets of the Qin dynasty and save your friends before your time runs out? 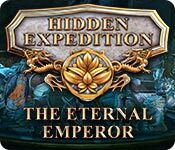 Find out in this astonishing hidden-object puzzle adventure!